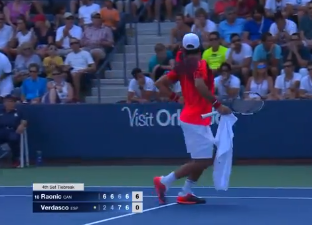 Verdasco was clearly unhappy with the number of medical time outs taken by Milos Raonic in their second round match up at the US Open 2015 (see picture for his mocking reaction on court during changeover). Raonic was still able to serve over 140 Mph at several occasions and Verdasco failed to take advantage of the uncomfort Raonic appeared to be in. Next up for Raonic is another Spaniard in the third round. Feliciano Lopez, who beat Raonic two and a half weeks ago at the Cincinatti Masters in straight sets. Feliciano Lopez is a much more composed player compared to Verdasco, who is known to be mentally fragile at times. Will Lopez be able to put an end to Raonic and his uncomfortable run at the US Open 2015?